January has been exceptionally gray this year. I think it always is. But I think the sun usually comes out occasionally. We went for a 9 or 10 day stretch (at least) this year when the sky was a solid, flat gray. I think even those with the most cheerful of temperaments were probably struggling to find ways to beat the winter blues. I am one who enjoys the peace and tranquility of gray skies. But this was even a bit much for me. In the middle of this stretch I found myself testing recipes for a new upcoming class. One of the recipes was for a grapefruit and avocado salad. 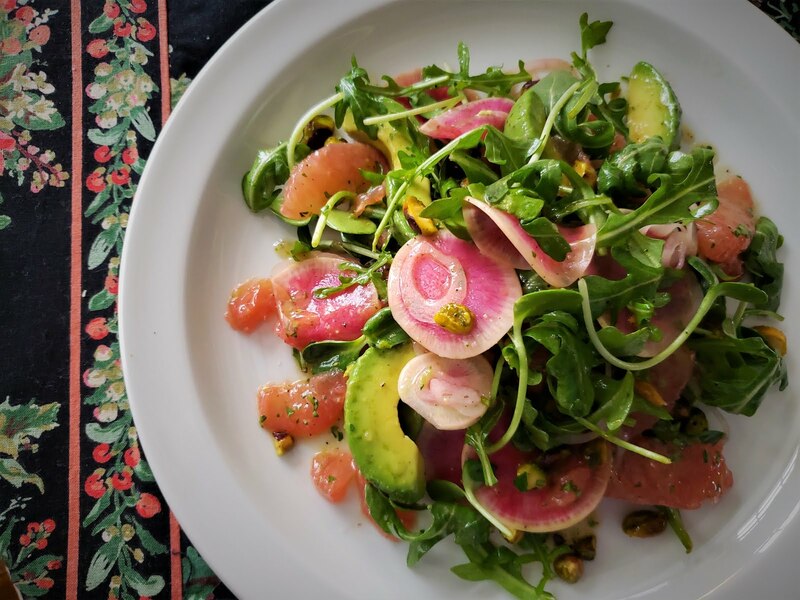 Avocado and grapefruit salad is for some reason something I associate with ladies’ luncheons from the 60’s and 70’s….so it isn’t something I would normally be attracted to. But I love citrus salads. And the combination of grapefruit and avocado really is delicious…and refreshing (and probably why it has never gone out of style). 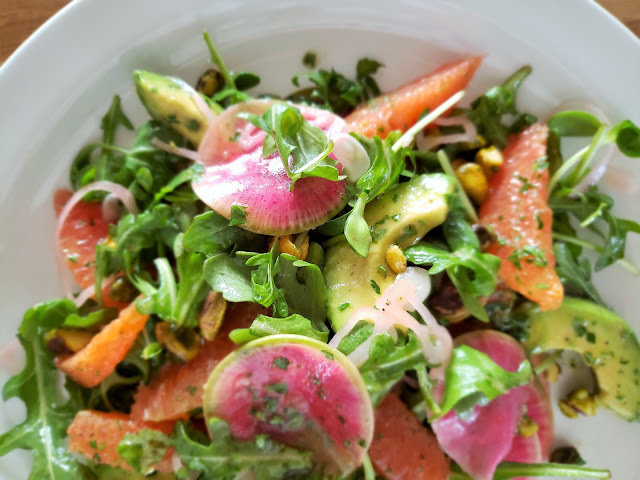 This particular salad–inspired by a recipe in The Big Sur Bakery Cookbook—attracted me because of the grapefruit reduction vinaigrette (as opposed to the slightly sweet poppy seed dressings I associate with fruit salads from the 60’s…). Best of all, it turned out to be just the thing to brighten that long stretch of gray. On a Saturday when we were about a week into the gray, I had planned on making this salad for lunch. I wanted to make it one more time to make sure I had all the measurements down correctly for my class handout. It was a market Saturday (which only happens twice a month in the winter) and I was feeling so unmotivated because of the weather (did I mention it had been cold and snowy too?) that I had decided to skip it. 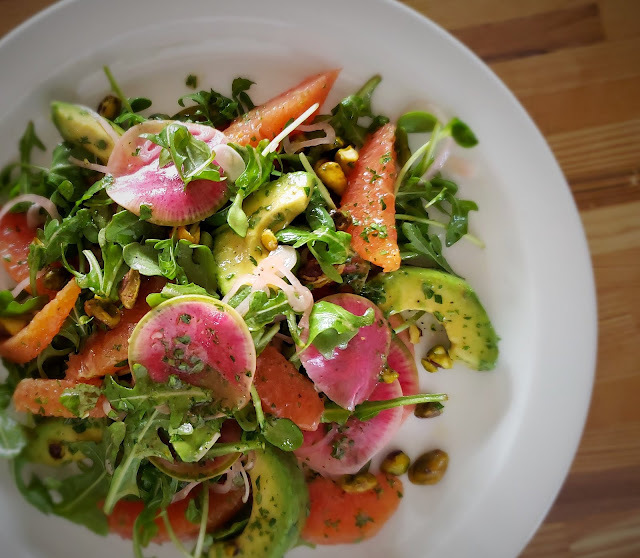 As lunch neared and I began to gather my ingredients, I ran into this feeling that had been nagging me that the salad needed something more—a spark of some kind. Something crisp… or crunchy, maybe. I had already included pistachios and a few shaved shallots, but I wanted to add something lively—and I was coming up blank. 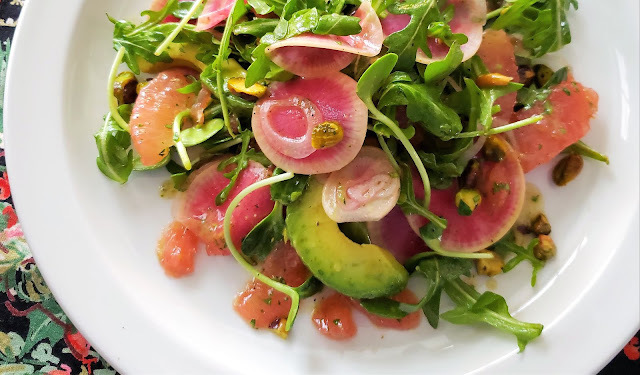 As all of these things ran around in my mind—the salad...the weather…how silly it had been of me to skip the market—I remembered that one of the purveyors still had beautiful watermelon radishes. And suddenly I knew that that was the spark I had been looking for. So I jumped in the car and managed to get to the market shortly before it closed. I thought the new version of the salad—which had been delicious before—was truly outstanding. The shaved watermelon radishes added much needed texture…and their slight heat added some nice zip. 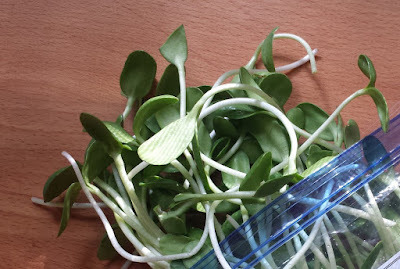 Additionally, while I was passing through the market I had grabbed a bag of sunflower shoots/microgreens (which are very good for you…and a super way to boost your nutrient intake any time of year, but especially during the winter)—so I threw some of those into the salad too. They turned out to be a delicious addition. I will probably not always have access to these when I want to make this salad. And many of those reading might not either. But if you do, their subtle texture—and rich sunflower taste—really add to the whole. I don’t know how much power can be attributed to the ability of food to brighten one’s mood, but this salad certainly seemed to have that effect on me. It was bright, juicy, tangy and refreshing—pretty much exactly what I was craving. 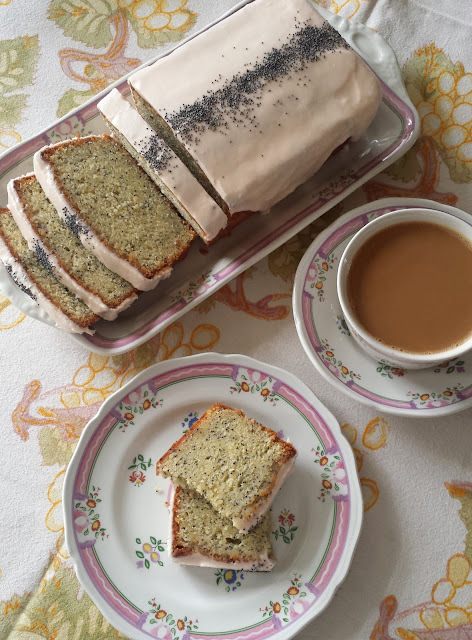 I can’t promise that it will have the same effect on others…but I can say that it was delicious (and certainly worth a try if you are combating a case of the winter blues). Place the grapefruit juice in a small saucepan and reduce slowly over low heat until syrupy—you should have about 1 T.
Put the reduced juice, vinegar, mustard, lemon juice and salt into a small bowl; whisk until smooth. Add the oil in a thin stream, whisking steadily, to form an emulsion. Taste and correct the seasoning and balance. Makes about 3/4 cup dressing. Place the pistachios in a small baking dish/tray and place in a preheated 350° oven. Toast until just fragrant (don’t let them get brown)…about 5 minutes. Let cool. When cool enough to handle. Chop coarsely and return them to their pan. Drizzle with a tiny amount of olive oil and season with salt. Set aside. Peel and trim the shallot. Using a mandoline, thinly shave the shallot cross-wise. Place the shaved shallots in a small bowl and cover with very cold water while you prepare the remaining ingredients. Place the salad greens in a medium sized bowl. Using a mandoline, thinly shave the radish into the bowl with the greens. Drain the shallots and spread on a paper towel. Press another paper towel on top of the shallots to blot them dry. Add the shallots to the bowl with the greens and radishes. Halve the avocado and remove the pit. Scoop each half from the skin with a large spoon in one swoop. Place the avocado halved cut side down on the cutting board and slice thickly (1/2-inch or slightly more) crosswise. 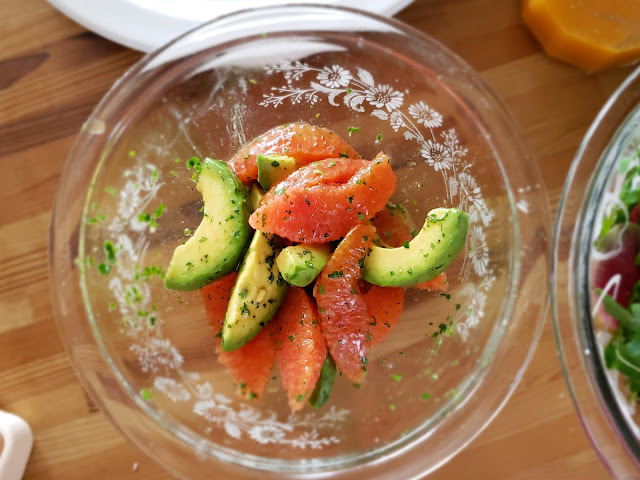 Add the avocados to the bowl with the grapefruit segments. Add the parsley. Season with salt and pepper and drizzle in enough of the vinaigrette to coat the fruits generously (about 2 T.). Toss to combine. Season the greens with salt and pepper. Drizzle the vinaigrette sparingly (less than a tablespoon) over the greens and toss. If necessary, add more vinaigrette and toss again. You want the greens and radishes to be lightly coated, but not weighed down. Spread half of the greens on a platter or individual serving plates. Arrange half of the avocado/grapefruit mix over the greens. Scatter half of the pistachios over the fruit. Repeat these layers once, using all but a small amount of the greens. 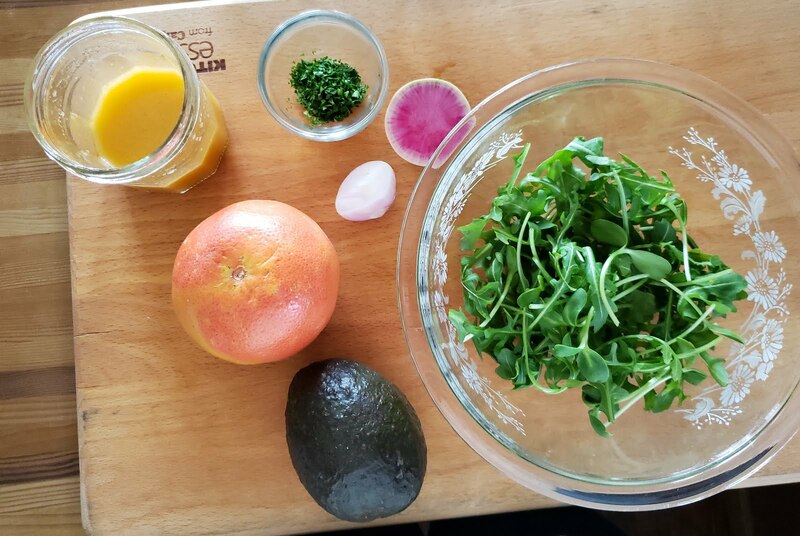 To finish, add the small amount of remaining greens and drizzle over any of the vinaigrette remaining in the avocado/grapefruit bowl. Serve right away. Serves 2 for a light lunch or 4 as a first course. I have called for raw pistachios because this is what I keep on hand. If you have roasted, salted pistachios on hand, by all means use them. No need to toast, oil and salt. Simply chop them coarsely. 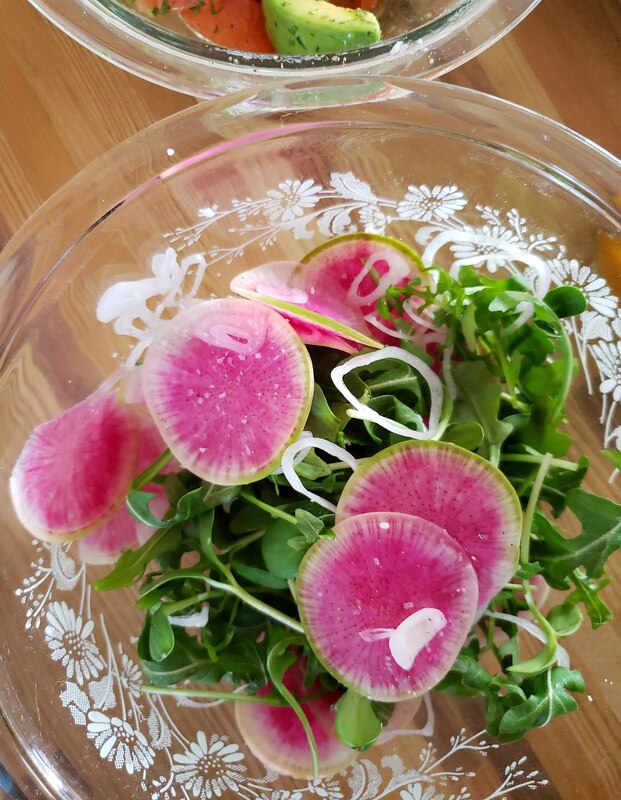 If you can’t find watermelon radishes, just use 2 or 3 small red or pink radishes. While I was testing this salad, I had some sunflower shoots/microgreens from a local grower on hand. I substituted some of these for a fourth of the arugula. They were a perfect addition and if you can get them I would encourage you to try them. If you like, substitute a mix of citrus for the grapefruit. One grapefruit combined with one Cara cara orange and one blood orange is particularly nice. Vinaigrette from The Big Sur Bakery Cookbook.